The Makeup Box: Lime Crime Countessa Fluorescent Dupe: Barry M Vibrant Pink Review and Swatches! Lime Crime Countessa Fluorescent Dupe: Barry M Vibrant Pink Review and Swatches! I've always considered Lime Crime's Countessa Fluorescent the Queen of Barbie Pinks. It's different from hot electric pinks and fuchsias like MAC's Candy Yum Yum in that it is a truer pink (as opposed to blue-based), not as deep, and almost highlighter-bright on the lips. Imagine my delight when my Barry M package included one that was extremely similar in shade. 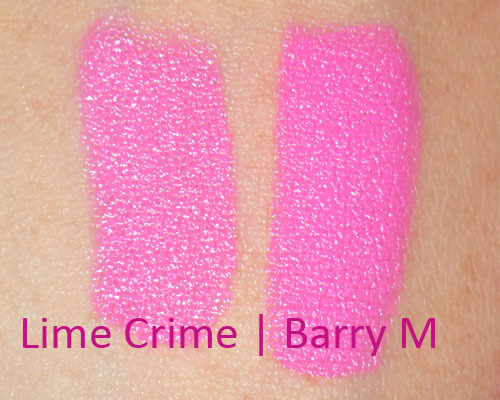 Meet Barry M Vibrant Pink (left) and Lime Crime Countessa Fluorescent (right). Barry M Vibrant Pink is something of a satin finish (similar to MAC Pink Nouveau), which means it is opaque and tacky, with a muted sheen - which I love. This is my favorite texture of all MAC lipsticks because it imparts great color, lasts really long, but doesn't feel as dry as a full matte lipstick. The right side of my hand is a little more shaded, or the two swatches would look even more similar. I was quite surprised to realize the Barry M was actually more opaque and intense than the Lime Crime, which is more of a creamy Amplified finish. If you like demi-matte finishes that last a long while, get Barry M Vibrant Pink. If you want a bit more moisture, get Lime Crime Countessa Fluorescent. The other difference is also that if you want to be really picky about it, the Barry M is just a hint deeper and more cool-toned. But just worn on the lips individually, the difference is not visible at all. 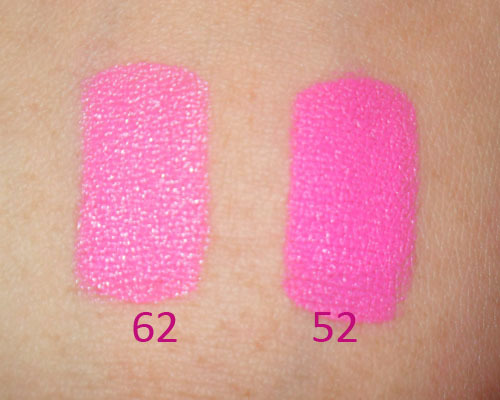 Barbie Pink vs Hot Pink: Barry M Lip Paints in 62 Vibrant Pink (left) and 52 Shocking Pink (right). Just for purposes of comparison, here is Barry M's Vibrant Pink swatched against Barry M Shocking Pink, the widely-acknowledged Candy Yum Yum dupe. As you can see, Vibrant Pink is more lustrous and reflective, whereas Shocking Pink is a deeper, cooler-based, more intense matte-pink. Do note that all the neon pinks do stain the lips, without exception. (If you've found any of these neon pinks that don't stain, let me know!) I believe it's the nature of the liquid dyes needed to get that intense highlighter-pink effect, as more subdued pinks I own, like MAC Pink Nouveau, do not do this. The main drawback for this lip shade? It can make teeth look dull and yellow, so watch out there! Barry M Vibrant Pink can be purchased internationally on Barrym.com for £4.49 each.